The failure of natural rock slopes, or engineered bedrock structures (e.g. tunnels, caverns, mines, and excavations) is closely tied to the progressive fracturing of intact rock. The physics of this process is, however, complicated – and even in engineered materials such as glass and steel, the interaction of conditions driving the propagation of cracks is difficult to constrain. Known as ‘subcritical crack growth’, the development of fractures over anything from seconds, to millions of years can be described by processes loosely termed ‘static fatigue‘, or ‘stress corrosion‘. Initially termed ‘season cracking‘, early observations of stress corrosion were made by British forces in India during the first World War. Cold-formed brass cartridge cases stored in stables through the monsoon were found to be cracked where the case was crimped to the bullet. Tests revealed that this was a result of ammonia from horse urine combining with residual mechanical tensile stresses stored in the cold-drawn metal to break down the brass at the atomic level. These ‘residual stresses’ are equivalent to those that cause rainbow patterns in formed plastics or car windscreens when viewed through polarized glasses, and result from compressive and tensile loads being frozen (or ‘locked’) into the structure when it was cooled and formed to a solid object. The combination of weak chemical, and strong mechanical, stresses in the cartridges led to the localization and growth of fractures over time. And since crack tip stresses scale exponentially with crack length, eventual failure could be quite sudden and hazardous. The solution for the military was to anneal the metal housings by heating them after forming, relieving the residual stresses generated during formation. Similar to metals, metamorphic and plutonic rocks formed under intense heat and pressure retain significant residual stresses when exhumed to the surface through erosion and mountain building (e.g. Leith et al., 2014). Although much of this stress is likely relieved over millions of years through the generation of micro cracks as rock cools and passes through the last few kilometers to the surface, enough likely remains that, when combined with tensile stresses generated by gravitational forces on steep rock slopes, subcritical crack growth can be facilitated by the simple addition of water. 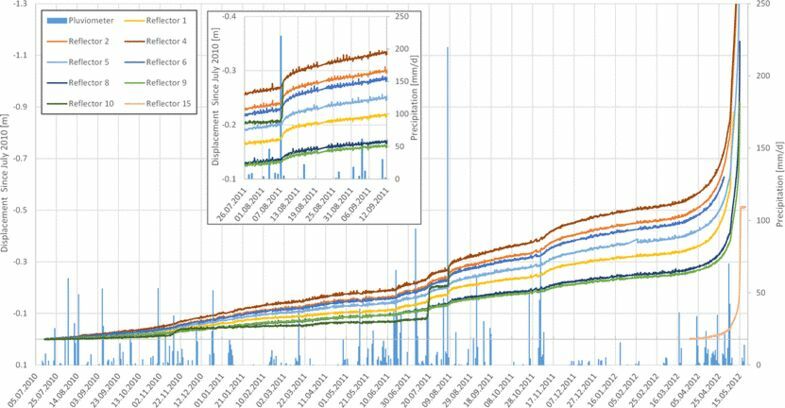 Observing slow crack growth in the field is difficult, and without reasonable control on environmental factors, attributing any observations to stress corrosion is nigh-on impossible. So we decided to substitute geological time with that of myself, Michael Krautblatter, and our PhD student Anne Voigtländer; while the wonders of big-mountain rock walls were replaced with a few cantilevered buckets of sand in the basement of the TH Cologne (Anne’s salary was provided by the Rosa Luxemburg Stiftung). Marmi Carrara s.r.l. was good enough to provide a quantity of 1 m long 99% pure marble beams for the experiments (as long as we came and picked them up and joined them for a tour of the quarry). 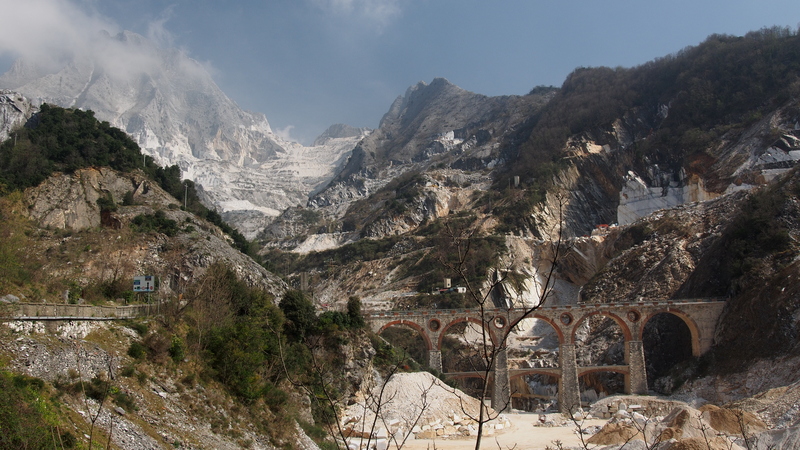 These were essential to the experiment, as the metamorphic origin of marble allows for the generation and preservation of significant residual stresses, while the exceptional purity of the rock from Carrara allowed us to undertake our long-term tests on extremely homogeneous material – reducing effects of sample variability. The goal of the work presented in our new paper (Voigtländer et al., 2018) was to observe the influence of water on brittle tensile fracture propagation through crystalline bedrock. While a number of studies have addressed the manner in which water and other fluids can accelerate the propagation of fractures across single crystals, or the deformation of specimens under uniaxial or triaxial compressive conditions (see Brantuit et al., 2013 for an excellent review), ours is the first test of it’s type in conditions mimicking bedrock environments with which humans most commonly interact. After very long testing periods (some samples were loaded for up to one year), and an appropriately long period of analysis, writing, and review, our new paper detailing the surprising results is finally out in JGR Solid Earth. Samples were prepared with a pre-cracked saw-cut notch on the top side, and loaded from below by a cantilevered bucket of sand. The notch was sealed with polycarbonate and acid-free silicone, and a small hole was drilled at the top and side to allow water to drip in, and freely flow out (we used calcite-saturated water to ensure we didn’t simply dissolve the stone). The rate of dripping corresponded to the lowest that our medical catheter bags could regulate. After loading dry specimens up to various levels of between 22% and 85% of the short-term sample strength, the introduction of water consistently initiated an immediate increase in strain beneath the tip of our artificial saw-cut notch. This may have been due to active expansion of intergranular bonds by hygroscopic expansion, or passive mechanisms such as plastification. 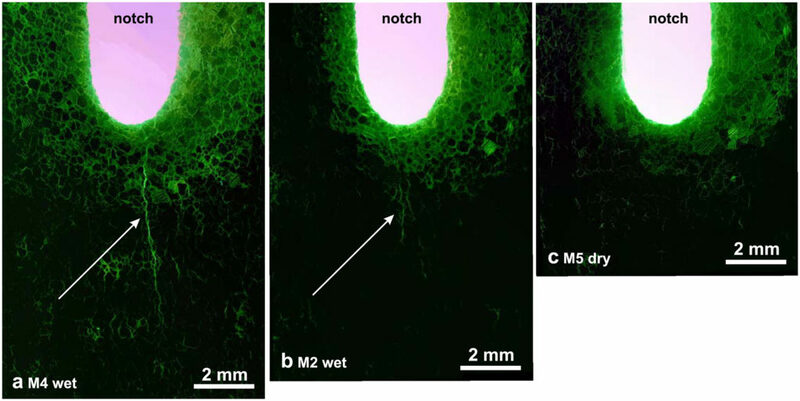 This strain was enough to initiate considerable periods of primary and secondary creep in samples loaded to more than 80% of their short-term strength, as the combination of mechanical stress and calcium-saturated water drove the propagation of cracks several millimeters beneath the initial notch. Dry specimens exhibited relatively little strain, and no ongoing creep behavior – an observation supported a lack of localized cracking in thin sections taken from the notch region and viewed under a microscope following testing (see above). All samples which were loaded to 85% in a wet condition were observed to progress through to tertiary creep (indicating imminent failure) and / or fail within four days, while sample M7, which was loaded to 85% prior to the introduction of water, rapidly entered secondary creep and progressed to failure in just 10 hours (see below). 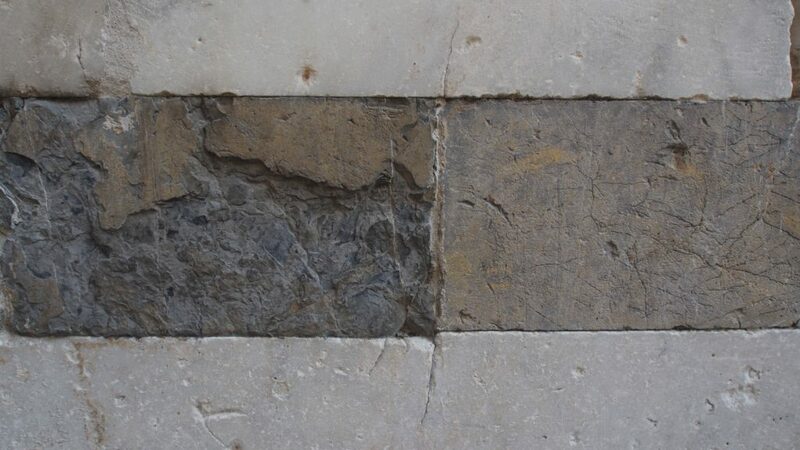 Much as the British soldiers found the sudden splitting of their cartridges during WWI startling, this sudden (in geological terms) fracture of sub-critically loaded marble beams is surprising in both it’s simple driver, and rate. Critically stressed bedrock fractures can arguably be found in most alpine settings, and while water pressure has long been associated with the triggering of rock slope instabilities following rain storms, observations of increased movement following moderate rainfall which follows a long dry spell perhaps suggest mechanisms observed during our experiments are not limited to the lab (see late accelerations of the Preonzo rock slope failure in the figure from Loew et al., 2017 below). Similar effects may be expected (for example) where increased tensile stresses are generated around subsurface excavations, or climate change causes a reduction of permafrost or ice cover, and rainfall is allowed to infiltrate into previously dry, critically stressed rock slopes. These topics will be the focus of a new joint ETH – SNF funded laboratory with custom-built servo controlled static loading frames and integrated climate chambers. A new PhD student, Ms Ying Li (funded by the CSC) will work with Dr Matthew Perras and myself to undertake experiments designed to explore the parameter space for which these effects are relevant to both society, and the origin of the landscape in which we live. Watch this space. Brantut, N., M. J. Heap, P. G. Meredith, and P. Baud. (2013). Time-Dependent Cracking and Brittle Creep in Crustal Rocks: A Review. Journal of Structural Geology 52 (7): 17–43. https://doi.org/10.1016/j.jsg.2013.03.007.